Even though Press works as a sales rep for a local supplement distributor, Press could only talk about food. He couldn’t talk about specific supplements or herbs because of government compliance laws, but ultimately, food was enough. With his genuine passion for whole foods, Press had us mesmerized from the beginning. Press shared, and he made a huge difference. One Vet in particular was both frustrated and exhilarated by what he learned that day. He was frustrated, because his first thought was, “why do they feed me all this carb-laden crap?” But then he was exhilarated because he felt empowered to make a positive change. In that moment, he vowed to himself to feed his body differently. He instantly said goodbye to sodas — Mountain Dew was his favorite — and hello to real food. Who knew that cutting out soda and adding in a protein-rich smoothie could be so powerful? The day after our conversation, I gave the Veteran two important tools that he could use as a guide to help him: a grocery list — all the foods that are high in nutrients that his body needed based on Press’ talk — and a cookbook. That afternoon he went shopping with one of the therapists from the facility and bought himself a blender to use for making his morning smoothies as well as a bag full of food to start preparing the next day. A few weeks later, the Veteran was discharged home, and I didn’t see him until mid-January, when he came back for more rehabilitation. I got a big hug and a smile from ear to ear. He looked great, was full of positive energy, and said he was still making smoothies everyday. He told me he never ate sugary treats or drank soda like he used to, as challenging as that was with all the desserts at the VA! When he “graduated” from the rehab program in February, he invited me to his good bye ceremony. It was so touching, and many happy tears were shed as he thanked all of the therapists, doctors, and different people who had had a positive impact on his recovery. He was a true success story because of all the steps he took to get better. If you don’t believe me, though, that food can make a difference, check out the photo of his blood labs below. The first column was when he was initially admitted to the program and still drinking Mountain Dew. The second set of labs were taken a mere three weeks after Press’ talk. He had dropped his Hgb A1c (long-term blood sugar) from 7.1% to 6.1% and his triglycerides from 1678 to 263! Lipitor and Metformin don’t work this way. You gotta change what you’re eating to see results like this. You have to take out the sugar. The third column was the one that made me smile more than anything. 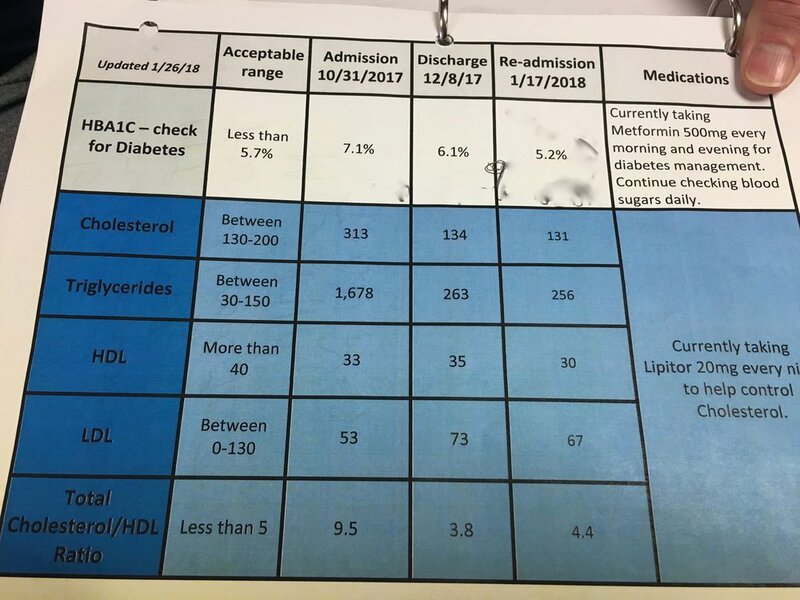 The Veteran was no longer diabetic. The doctors and nutritionist were totally perplexed but refused to take him off of the diabetes drug, Metformin, or the Lipitor. Surely he was just responding well to the medication? It couldn’t have been the foods! Oh yes, it could, and it was. A photo of the Veteran's lab results that the nurse prepared for him. Please note that the photo was altered to remove a phone number that the Veteran had written on the paper. This all happened in 2 months, with no supplements except for an organic protein powder in his morning smoothie. Earlier I mentioned that the Veteran had four important tools for transformation, but I had only listed three (the grocery list, the cookbook, and the blender). What was the 4th important tool? Hearing Press’ talk was all the Veteran needed to change his mind about food, sugar, and health. Intuitively the Veteran knew that pharmaceutical drugs were not the answer, certainly not for the long term. He knew in his heart that there was more he could do. Unfortunately, as good as the doctors and therapists were at helping someone rehabilitate after brain injury, they didn’t know how to use food to help him heal, because not only was food not part of their training, but there was little nourishing about the food served at the VA (especially with all the budget cuts). But Press knew, I knew, and most importantly, the Veteran now knows. He made it his goal to start feeding his body real food, one smoothie at a time, and it has made all the difference. How do I know that the Veteran is still doing well now that he is on his own in the community? Veteran: Hi Jen! Thank you so much for your help. I make smoothies everyday because of you. I feel like a new man! Me: Hi [Veteran]! That totally makes my day. I’m so happy to hear you are doing well. Veteran: I never knew. Thank you so much. Me: You are very welcome… I just gave you the tools. You put them to use! Veteran: I have been averaging 6 hours a day…walking. 2 hours in the gym… I feel like I’m 30 again! Please tell [Press and] Mike thank you. The Veteran is now being followed by a primary care physician who is completely supportive of his goals and choices. He is medication-free and plans to stay off Metformin and Lipitor for the rest of his life because he feels so much better without them. My friends, this is why I do what I do. This is why food matters. This is why it is so crucial that health care practitioners take the time to find other tools beyond those that they were taught in school. People have the ability to transform their lives, but they must truly know what is possible. It is both the gift and responsibility that health care providers have been given: to help others in this lifetime. YOU have been given both a gift and responsibility to make the changes in your life you need to take, one step at a time. And for better or worse, sometimes you have to be the one to educate your health care practitioner about what is possible when it comes to earth-based medicines. They weren’t taught about nature in school. We have to help shine the light for them. You are not alone on this journey, though. Come over to the Facebook group, the Wellness Oasis, and share your story. Find your tribe. Let’s support and help each other. Together, we do make a difference. Both Press Maycock and the Veteran have given me permission to share this story with you. *Due to federal compliance laws, I cannot share the name of the supplement company or product that the Veteran used. Want first dibs on blogs and juicy content that you can share with your skeptical doctor? Sign up here for my mailing list and get it all hand-delivered. This will help me customize the content I send you. Thank you! We promise never to share or sell your information.